Wedding PR: The Knot, Travel Channel, Brides.com, and more! Hooray for Friday! We’ve got some great client features to share today, including The Knot, Travel Channel, Brides.com, and so much more. To check out more of our recent client features, see below! 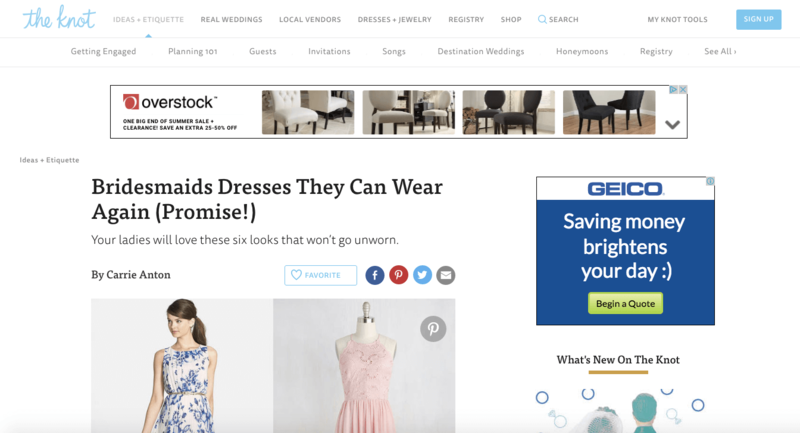 Azazie was featured in The Knot article Bridesmaids Dresses They Can Wear Again (Promise!). See the full feature here. Mike B Photography was featured on United With Love with an engagement session at the National Mall. See the full feature here. Destination Weddings and Rochelle Cheever Photography were featured on Travel Channel in the article Wedding Destinations for History Buffs. See the full article here. 100 Candles was featured on Style Me Pretty with a pastel themed wedding inspiration shoot. See the full feature here. Taylor’d Events was featured on Blissful Creatives with her guest blog Brand Ambassadors: What they are and why you need them. See the full feature here. Where Will They Stay?, Rentivist, and Timeline Genius were featured on Huffington Post with the article Five Tools You Should Use for Your Wedding – But Aren’t. See the full feature here. Fantasy Sound Event Services, Wente Vineyards, Taylor’d Events, and Destination Weddings were featured in the Brides.com article 9 Small, Unexpected Wedding Costs You Shouldn’t Forget to Budget For. See the full article here. Be Photography was featured on The Perfect Palette with a Jamaican destination wedding. See the full feature here. OFD Consulting was featured on Honeybook with the guest article Becoming an Expert in Your Field. See the full feature here. Don Mears Photography was featured on United With Love with a vineyard wedding. See the full feature here.